The special offers for boarding a small satellite as payload onto UniSat-7 are still valid for a limited time, don’t miss out the UniSat Platform advantages! Customers can currently benefit from promotional fares to make their CubeSats or another kind of IOD/IOV payload fly on GAUSS Space bus. 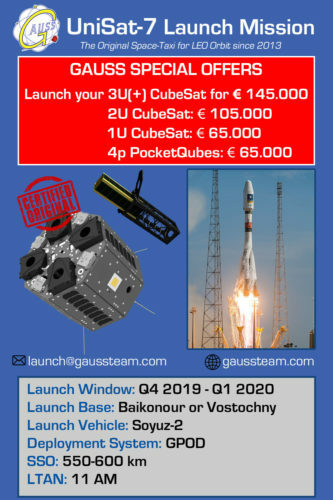 UniSat-7 is a small spacecraft planned to carry a number of smaller satellites (class CubeSat and PocketQube) and fixed payloads (mostly technological demonstrators). UniSat-7 will be launched as secondary payload from the Launch Vehicle Soyuz-2 commercial mission operated by GK Launch Services in the period Q4, 2019 – Q1, 2020. Fixed payloads are also welcome onboard the satellite/platform: like IOV/IOD, representing a key phase to test Space products, gain flight heritage and for which we can provide the subsystems necessary to make your device reach Space. This is the opportunity to be part of a cluster mission of satellites with an operator like GAUSS, expert in launching satellites in the LEO Constellation.